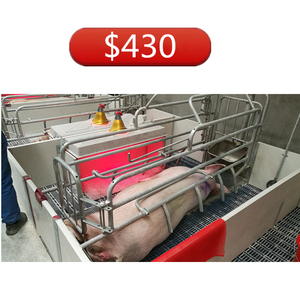 Our hot dip galvanized sow gestation stall is apace-saving and easy to manage, which is fast and easy to install. 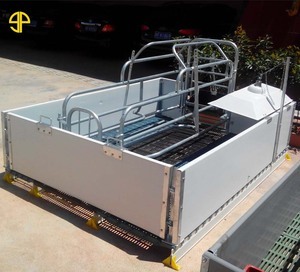 Double Back doors Name: gestation crate Brand: HENGYIN Original: CHINA Back door of hot dip galvanized sow gestation stall, firm enough and convenient for artificial insemination. 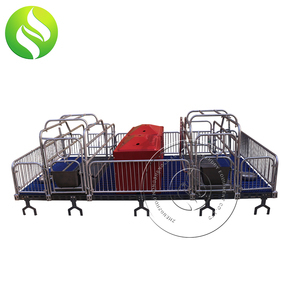 The company focuses on the production of Automation equipment for pig, chicken and cattle farm. Our principle is &ldquo;Value, Price and Quality&rdquo; . So just give us a chance ,We won&rsquo;t disappoint you. 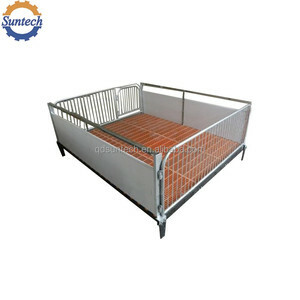 Yours, Trustworthy friend : Pig Nursery Crate. 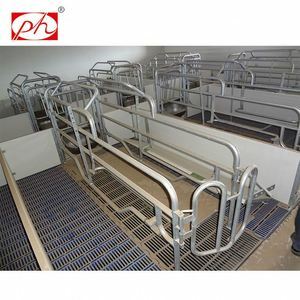 4,Height of PVC board is 50cm, could make sure sow&rsquo;s ventilation, at same time, could ensure piglets&rsquo; warm condition. How about product quality9 We have more than 20 branch companies in different city. So, we know market and quality very well, our QA team also check material and check products before loading to make sure great quality. good heat reserving performance, anti - corrosion and easy to clean. 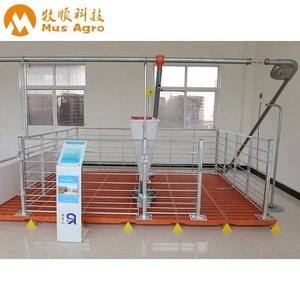 Poultry house design and construction preparation Guidance; D. You are welcomed to our factory to have a visit and face to face negotiate with us. 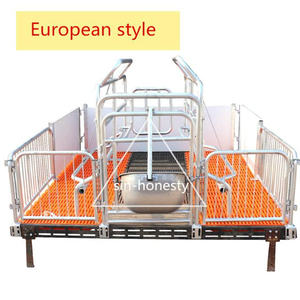 B.
factory high quality hot dip galvanized pig farrowing crate for sow used in pig farm equipment Size: 2.4*1.8*1.05m; Main crate: Out pipe &Phi;33.5(1")*2.5 mm, inward pipe &Phi;26.8(3/4")*2.5 mm, hot dip galvanized for the whole pens; Piglet fence: H500*W35mm PVC panel; Floor: Galvanized steel slat 2400*700mm with feces outlet; Plastic slat: 700+400mm; Pedestal: GFRP beam (2400*120mm); Heating system: Open incubator with heating lamp and lamp cover, and 1000*500mm electric hot plate; Trough: Sow: SUS 304 stainless steel(475*380*250 mm), piglet: SMC round trough (moulded composite); Feature: Front and back doors can be opened. Factory Introduction 1. 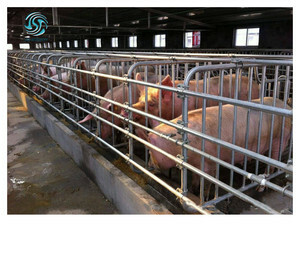 The largest pig farm equipment factory in China right now with an area of over 22,000 square meter ; 2. Over 1000 employees and 43 technicians, including 2 senior engineers and 4 chief engineers; 3. 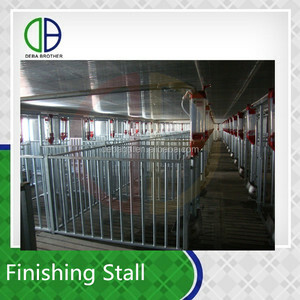 With a daily producing capacity of 1000 sets of farrowing crates, 300 sets of gestation stalls, 80 sets of fattening fences, 100 sets of nursery fences, 1000 pieces of galvanized steel slat floors, 60 sets of stainless steel feeders and 200 meters of feeders; 4. Automatic producing facilities for pens, feeding system, and ventilating system, with an area of about 66,000 square meter ; 5. High-tech and listed Partner of SCHAUER, ASSERVA, ROTECNA, YMI and etc ; 6. 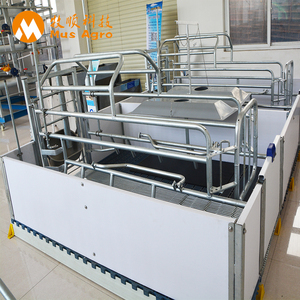 Have our own pig farm, for testing technology and product before launching them into the market. Producing Facilities Our Ecological Farm Package Details Our Team Our Customers 1. WENS(one of the top 10 pork producers in the world) 2. Zhengbang(one of the top 10 pork producers in China) 3. COFCO(one of the top 500 firms in the world) 4. Subsidiary firm of AGCO (one of the top 500 firms in the world) Telephone: +86-791-88535723 Mob: +86-18770220402/15179125822/17770814165 Headquarter(factory): No 133, Saiwei Ave, Hightech & Development Zone, Xinyu City, Jiangxi Province, China.